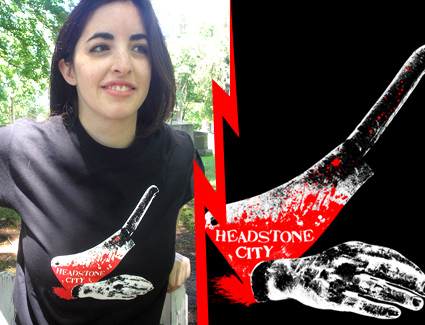 Headstone City is proud to present our latest batch of horror shirts. 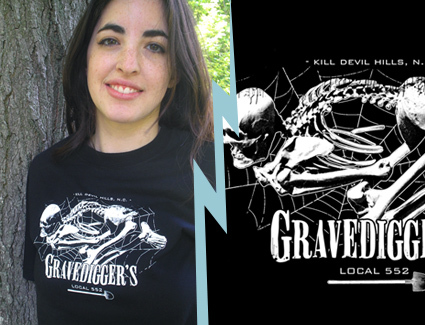 A couple of these shirts debuted at this year’s Fangoria convention in NYC and some of you might have even picked a few up. For the rest of you, here’s your chance to be part of the in crowd. (n) Based in North Carolina, Local 552 was first formed in 1826. Originally consisting of 5 members, the union has reached over 50 members throughout the 19th and 20th century. Gravedigger’s Local 552 is responsible for all graves that are dug in and around Kill Devil Hills. In 1926, Local 552 celebrated its centennial. To mark the occasion, the members held an anniversary party at the first cemetery the union first dug, back in 1826. The members drew straws and whoever drew the short straw would spend the night in the cemetery alone. Henry Walker was the unlucky winner and slept on the grave that was first dug 100 years prior. The following morning, the other members arrived at the cemetery and found no sign of their friend. Instead, Henry Walker’s name was carved on the tombstone and Henry was never seen or heard from again. There have been claims that Henry’s ghost still haunts the local cemetery and you can hear him laughing among the tombstones. (n) This is the hand of the guy who would not shut up on the plane ride to Transylvania last year. After severing his hand from his wrist, I noticed the blood splatter on the knife had formed writing. With a closer inspection I could see it said “Headstone City”. Thus, the name of the t-shirt company was born. (n) If you’re gonna go out, go out in style. 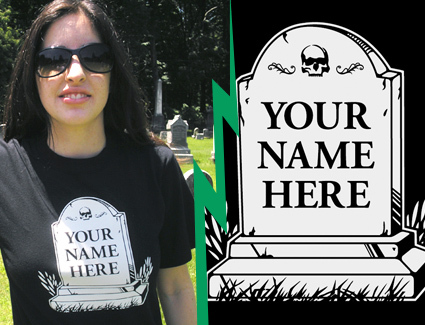 Get a tombstone inscription that people will never forget. They’ll come from miles around the globe to see your witty personality…even if you are buried 6 feet beneath the earth’s soil. Or you can always get cremated and waste a perfectly good joke.